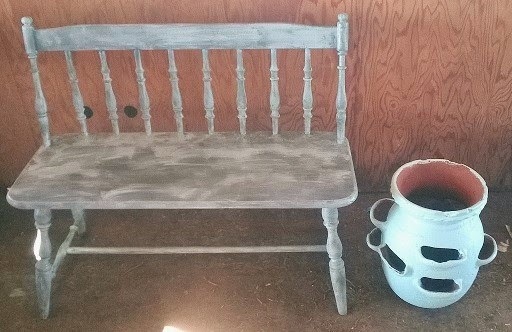 This Early American style bench is almost ready for a new home. Sea green, which is a gray green that does not show well in these pictures and mint. 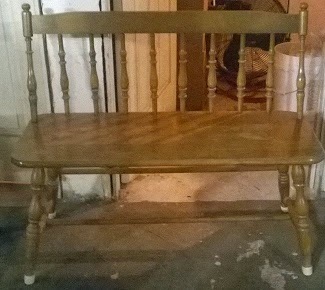 This was presented to the last owners as an antique, but I believe it is from the 60's or 70's when there were a lot of Early American type benches being made. 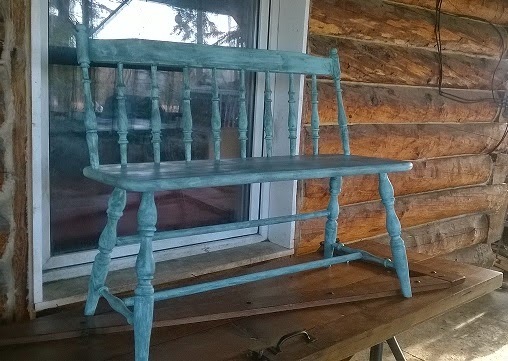 I wanted to give it an aged appearance so I used a dry brushing technique with mint paint over the Sea Green color. 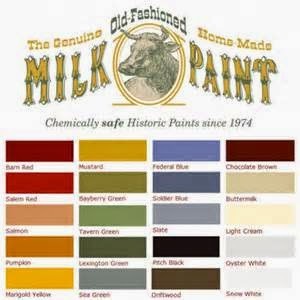 The Sea Green color is more accurate in this paint chart. 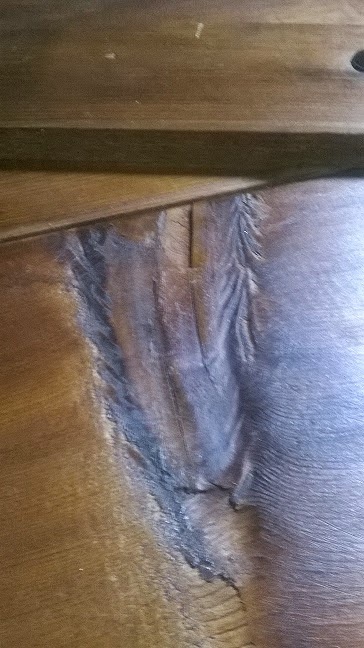 Because it is supposed to look aged, there are places where the wood grain shows through. 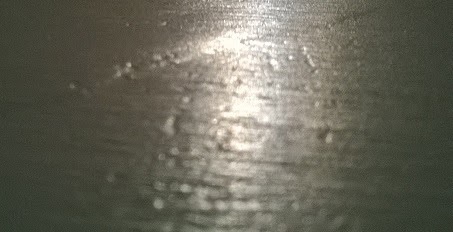 It has a spray polyacrylic finish. 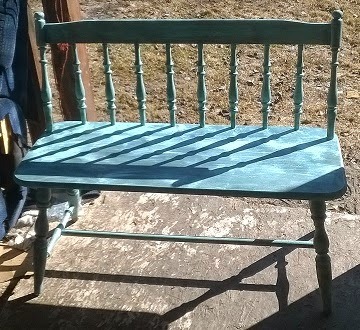 I think the new Shabby Chic look suits this bench! Bright sunshine picture! Am I imagining it or did everyone in the 60's and 70's have at least one piece of French Provincial type furniture??? Our "guest room" had a whole set of it. Maybe everyone had some in their seldom used guest rooms?? Maybe that is why there is still quite a bit of it around. I keep running across pieces of it. They are still structurally sound, but the off white and gold are so dated. I wanted something just about as far away from the original look as possible and I think I came up with it. Very bright pink with silver trim, it is the perfect girly piece. I usually shy away from doing something that is so gender specific, but I was hoping this would turn out to be a really cute and unique piece and I think I have achieved that! 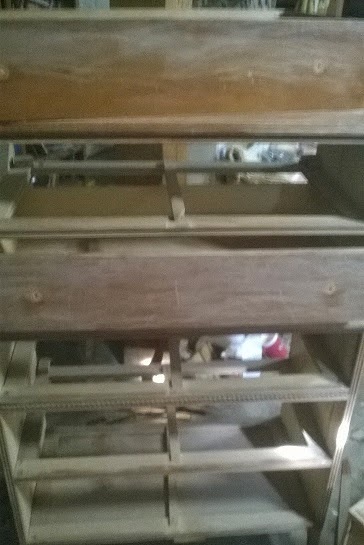 This dresser came to me needing quite a bit of repair. Deep scratches, a splintered back, and the left leg of the apron on the bottom front was broken off. Since the apron is not actually the leg, but more of a false front, I was hopeful I might be able to fix it. of the drawers. 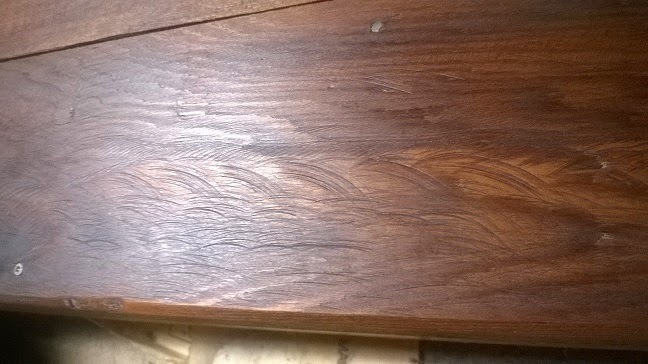 There was so much damage that the finish is still not flawless and there are some blemishes but this dresser is sturdy and useful. 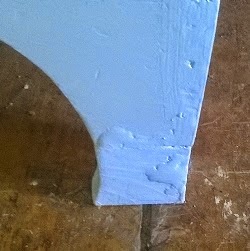 The addition to the leg of the apron is not perfect and flaws can be seen close up, but once again, this dresser has gone from unusable to useful again. The color I chose for the dresser is Manhattan Mist by Behr, and it is a gray shade that seems almost blue. 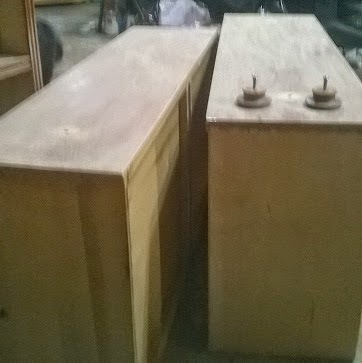 There is a bit of silver glaze on the rope detail and on the faux drawer fronts on the third drawer from the top. Decoupage has been become popular again, and I love these characters.
. 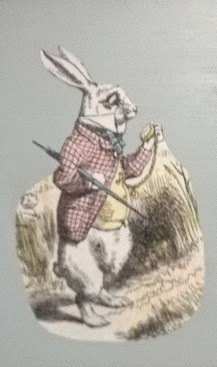 They are copies of the original Alice in Wonderland characters by John Tenniel. 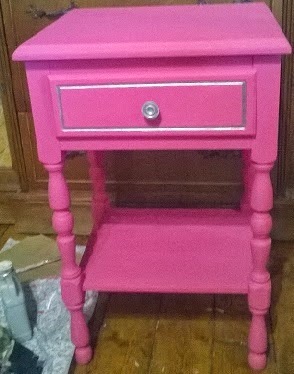 I colorized them to look as thought they were done with watercolors, before I added them to the dresser. I added a brand new sturdy two-piece back to finish it off. The dimensions on this are 50 1/2 inches tall, 18 inches front to back, and 33 1/4 across the front. 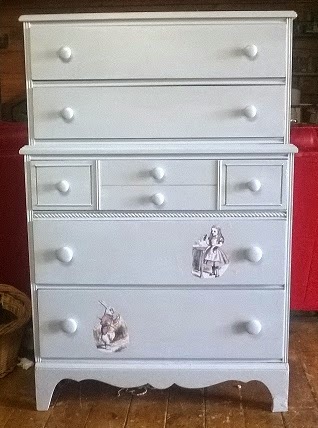 This dresser has gone from being possibly destined for the landfill, to a cute usable piece. 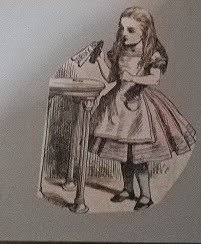 I can see this in a nursery or child's room, or in any Alice lover's home. 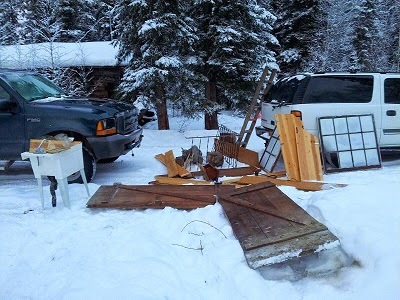 We had hoped to get back into the cabin and we thought it was going to be torn down for all of the wonderful old round logs. Sadly, it was burned down, and although it provided the fire department some needed practice, it was sad that this old cabin was lost. There was a wonderful piece of burl wood that we especially wanted to save. 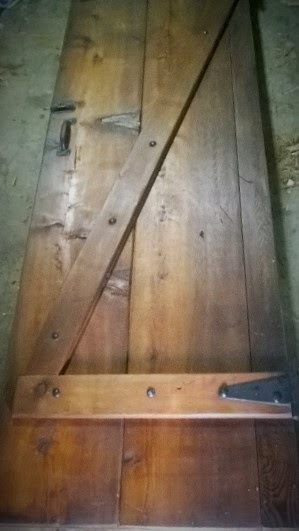 This new piece was made from one of the very old basement doors that we rescued. 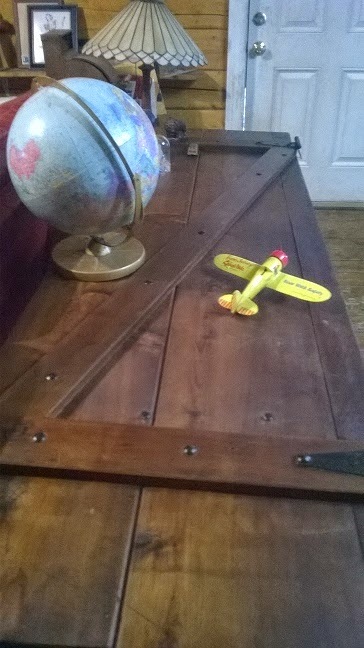 It has so much character and as soon as I saw it I knew it would make a great table. 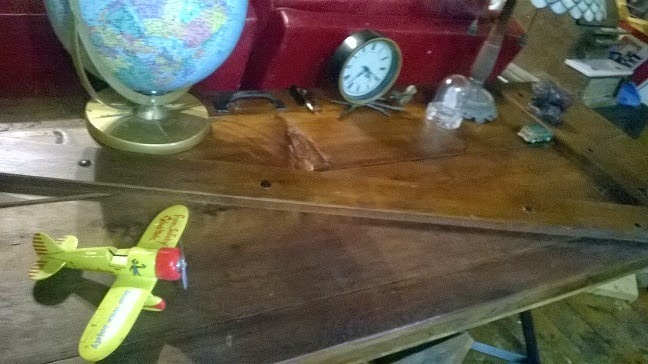 Some cleaning, a little TLC, Danish Oil, and some poly and the wood took on a beautiful glow. I left the hardware, so much character! I originally intended to use pipe for the legs, but so many of the industrial type tables right now have them and I wanted something that would be a little different. I had an opportunity to get a pair of boat jacks, and thought that this might be the answer. 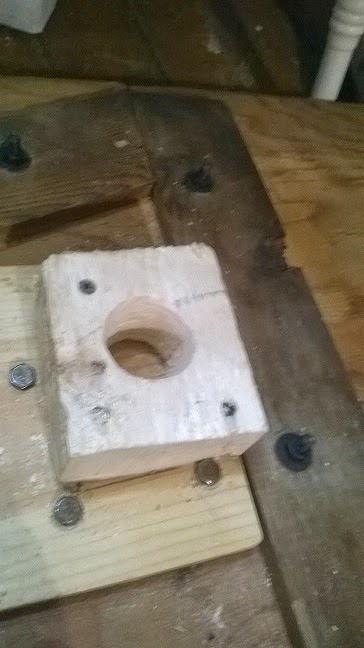 Eventually I had to abandon the idea of using the entire boat jacks, and had to settle for making wooden receivers that the lower half of the jacks could fit in to. 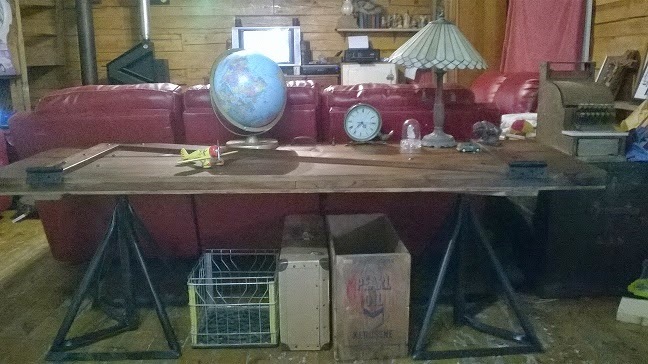 This table is truly a one of a kind piece. Hours and hours of planning, blood, sweat and tears went into the making of it. Each part of building it had specific challenges and obstacles that I had to overcome. This is truly a piece of history and I'm so glad I could preserve it and turn it into something useful. 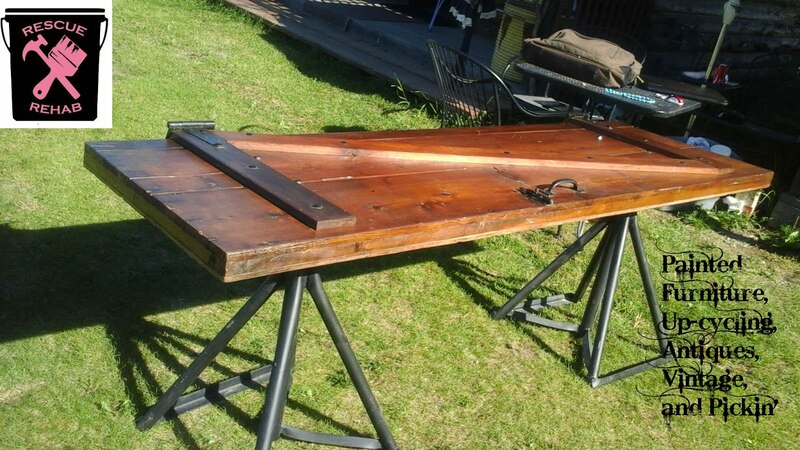 It would make a great entryway table, desk, or tv table, with the addition of a piece of glass, this could even be a dining table! 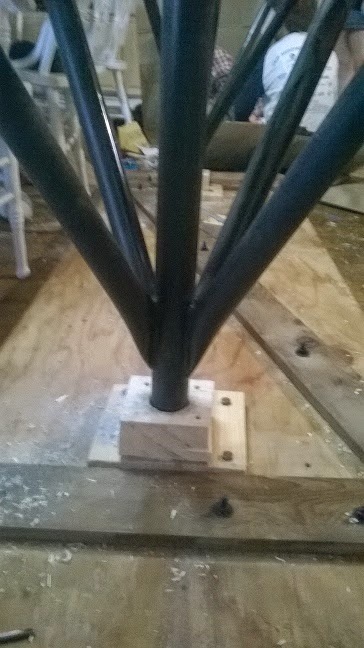 With its pretty wood and black legs it has an industrial/farmhouse look. The dimensions on this piece are: 27 1/2 inches tall, 25 inches wide and 79 1/2 inches long.